This week’s teaser is from Adam’s perspective, and from a chapter that I actually got super nervous to write while writing. Like, I had to actually get up and walk around just to get rid of some of the nervous energy before I sat back down to write. This may just be a teaser and doesn’t give you the entire scene, but I think you’ll get the idea of what comes a little bit later. I’m exhausted. In the best possible way. “Are you okay?” Courtney asks from across the table. I made reservations for us at the Boathouse in Central Park, knowing that I’d want to take Courtney out to celebrate after the draft. She balked at the prices when the server gave us the menu, but, prices aren’t something I really have to worry about anymore. Even if they were, I’d want to do something nice for Courtney on our first trip to New York. Willa told me this was one of the most romantic spots in the city, so it sounded perfect to me. “I’m great,” I say, even though I haven’t slept in almost two days. After the draft, I did a press conference, met with my new sports agent who introduced me to a financial advisor, who took me out for celebratory drinks at some members-only place, and then met up with my brothers and Courtney for an extremely late dinner at a greasy spoon. I had so much energy that even when I went to bed, I wasn’t able to sleep. Mostly because I knew what was going to happen today. The server brings our food and everything looks delicious, if overly fancy. I’ve never understood the need for garnish. If the food tastes good, why does it need to look good? “This smells amazing,” Courtney says as her steak is placed in front of her. As we begin eating, I realize that my hands are shaking. Though I was nervous about the draft, I think I’m more nervous about tonight. Courtney and I talked some about what would happen after the draft, but not a lot. It didn’t seem like there was much we could do until we knew where I would be going. The only thing we did know was that most likely, I’d be moving away. So we decided that no matter what, we’d try to make long distance work. I’m going to do a hell of a lot more than try. 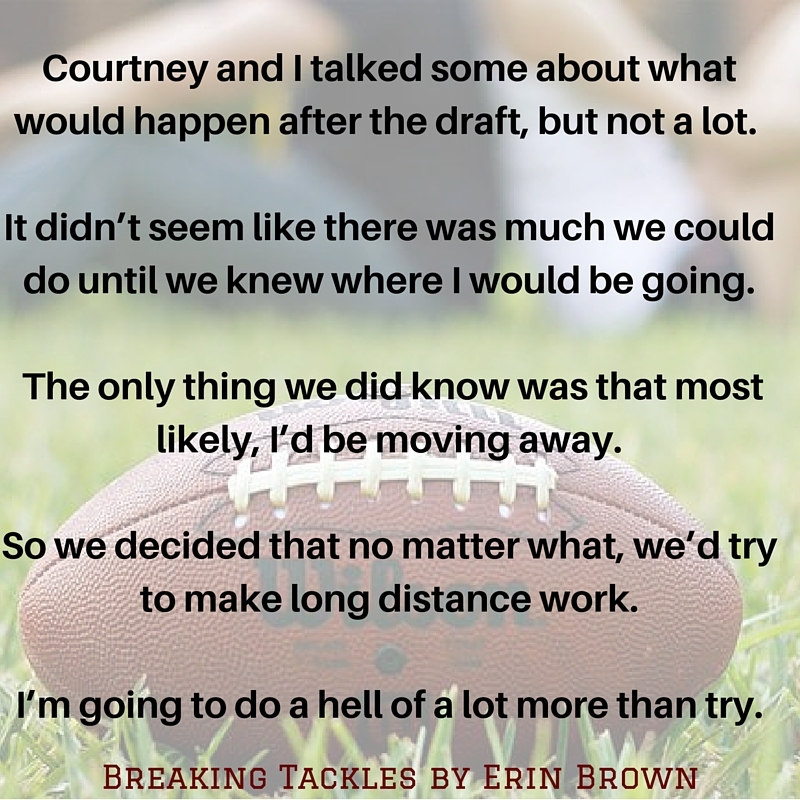 Breaking Tackles goes on sale September 22nd!